Our Clear Pine Fire Doors comes in a classic 1920’s/1930’s design. These can be equally suited to both modern and period properties, depending on your interior design theme. The door has one large square panel at the top with three rectangular vertical panels below. With Online Door Store you do not need to compromise style. The fire door matches its standard counterparts so that you do not have to have different designs in the same area of the house. 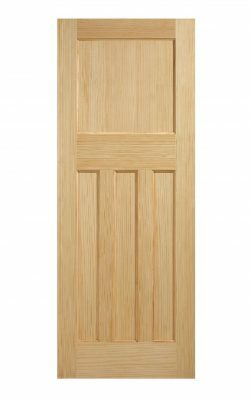 If you are looking to upgrade a house that already has 1930’s style doors then this is the fire door for you! 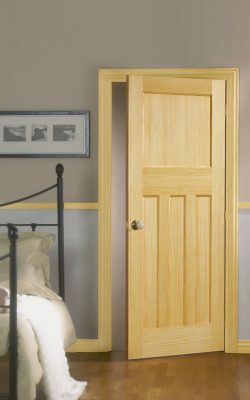 Our Clear Pine Fire Doors comes in a classic 1920's/1930's design. These can be equally suited to both modern and period properties, depending on your interior design theme. The door has one large square panel at the top with three rectangular vertical panels below. With Online Door Store you do not need to compromise style. The fire door matches its standard counterparts so that you do not have to have different designs in the same area of the house. If you are looking to upgrade a house that already has 1930's style doors then this is the fire door for you! 1930’s Clear Pine 4 Panel Internal Fire Door. FD30 for Thirty minutes fire barrier. Distinctive ‘three over one’ Thirties look. One large square panel over three vertical rectangular panels. Un-finished ready for your final treatment. Adjustments on all sides up to 3mm. Available as a standard (35mm) version. Why fit a Fire Door? Modern building regulations are very strict on the use of fire doors in certain instances. It may be that your architect has stipulated a fire door in certain areas. It is always good practice to separate a room with a source of fire such as a stove, fireplace, oven or hob from other areas of the house. In this way, if an accident should occur, the fire door can provide your family with vital extra time to make their escape. Our fire doors are FD30 rated to give thirty minutes of time before they will burn through. Fire doors create a passive fire safety system, protecting both domestic and commercial buildings from the spread of fire by confining it to a specific area for a longer period of time. This allows people within the building enough time to escape via alternative routes which might otherwise be cut off by fire. They are a legal requirement for particular buildings, including for flats and commercial properties, but the prime purpose for fire doors is to save lives and halt the progress of a destructive fire. Installation of fire doors must be done correctly, please see our help and advice section for further information on this critical element. The intumescent strip is just one of the key components in a fire door. Running around the edge where the door meets the doorframe, it helps to trap the smoke, preventing it from spreading, as well as assisting in keeping flames from spreading beyond the door. If you would like further help with your selection(s) please do not hesitate to give us a call on 01132 234898.